Purpose. The training was developed specifically for teachers, parents and medical professionals to help them better engage, connect, and communicate with the children and families in their care. Length. The training can be customized to meet your needs, from a 4-hour workshop to the full 18-hour training. Nature of the Training. 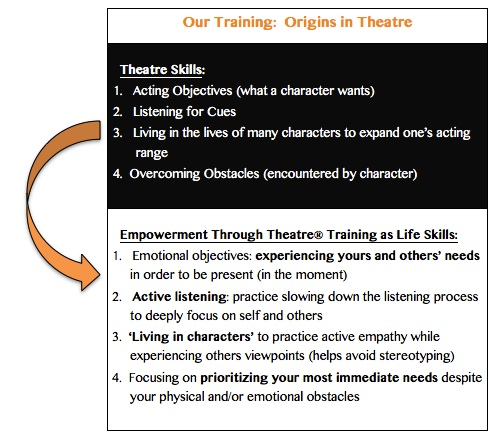 The training is interactive and sequential; participants learn basic skills in being present and active listening before learning active empathy and participate in role-plays (i.e. living in the lives of 8-26 different characters depending on the length of the training), allowing for practice and observation of the skills learned. Outcomes. Parents, teachers and medical professionals all report positive outcomes when using skills learned through ETT™. Click below on each tab to learn more about the components of ETT™ training.